Located in Montemor-o-Novo, Portugal, Quinta da Plansel cellar was created in 1997 by Dorina Lindemann. 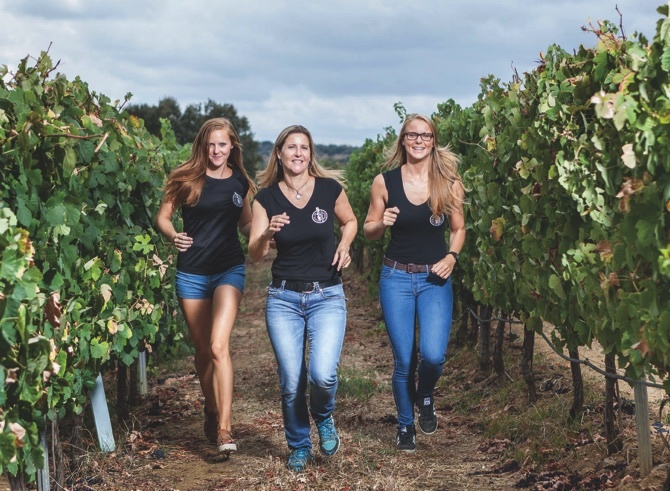 Graduated as a winemaker from the University of Geisenheim, Lindemann became interested in Portugal through the influence of her father, Hans-Jörg Böhn. Quinta da Plansel produces only Portuguese wine varieties. This year, the 75-hectare winery is expected to produce 500,000 liters. Interviewed by the Times during a promotional visit to Macau, Lindemann praises the Portuguese wine varieties and explains that the company’s focus is on quality, rather than quantity. Macau Daily Times (MDT) – You studied viticulture in Germany and later you established yourself in Portugal. How did that happen? Dorina Lindemann (DL) – When my daddy was 18 years old, he had the fantastic idea to buy a boat together with three students and to travel around the world. He got stuck in front of Lisbon, where the boat capsized. I think my father stayed there for two or three months– it was impossible to go out because they lost their passports. I don’t know what happened to him, but it was something strange. He fell in love with Portugal, which changed his mentality and he didn’t want to go back home. The idea stayed in his head: ‘One day I’m going to live in Portugal’. I think he passed that to me: the passion for Portugal. My father went to Portugal, he finished studying there, he married my mom luckily – now I’m here, I got two children and a brother – and when he reached 40 [years of age], he sold everything in Germany and decided to follow his heart and go back to Portugal. MDT – Your family was already involved in the wine business back in Germany? DL – Yes, an import for wines. He [Hans-Jörg Böhn] tried to always import Portuguese wines, but it was impossible at that time, the wine was undrinkable. It was horrible, with too much acidity or just color and no fruitiness. It was impossible to import Portuguese wines. He said: ‘I have to research, I have to make something else for Portugal.’ Before he went there, he studied [winemaking] for four semesters at the University of Geisenheim. In 1975, exactly after the revolution, my father moved over to Portugal. He bought a piece of land 100 kilometers east of Lisbon in a beautiful old town named Montemor-o-Novo. Around 40 years ago there was nothing there, it was a poor country site. He began a fantastic project with the University of Geisenheim in order to find out how many native varieties exist in Portugal. It was my father who discovered that the most hidden varieties were still in the dark. It was him, together with a professor from the University of Évora, named Colaço, who marked the plants to observe them over [many] years and discovered that Portugal has got more than 380 native varieties. On the world stage, Portugal comes in second following Italy, which has 800 native varieties. It is really amazing. From the 380 varieties, he selected 150 and brought them to Alentejo. We made microvinification from each of these varieties for over 10 years. At that time, I always came and visited him during summer and I loved his work. I loved the grapes and loved the vineyards. It was my passion, I was young and wanted to be a winemaker. Everybody was always: ‘You are a winemaker? It is impossible. You are female, there are no female winemakers.’ It was in the hand of men at that time, even in Germany. MDT – You mentioned that Quinta da Plansel was set up as a “women power” company. How so? DL – I finished university and only after that I went back to Portugal in 1993. My father already had his company established and a nursery where he produced wine plants for those, who are nowadays my competitors. When I arrived, I worked a bit in the nursery and I started to make my own wines at the University of Évora. They had some vessels and they gave them to me and I could work there and start to get my first experiences. In 1997, we started to make the first wine in Quinta da Plansel and we started to build up the winery. The winery wasn’t built at once, it was step by step. Every time I had a little bit [of] money, I built up new stuff or bought more vessels. My winery started very small, producing 20,000 liters of wine, which grew over the years. By the time I started in 1997, my husband sent two men to work with me but it was impossible… macho men in the Alentejo. At that time it was usual for women to be having a coffee or be at a bar, the mentality was a bit difficult. Sometimes in the center of Portugal, women were eating in the kitchen and the men in the living room, who would be served by the women. We still find that in Portugal. At that time I decided not to work with men anymore. I had experience working with some women in the field, one of them spoke a little bit of German, because she had lived there. She and another one started to work with me in the winery. MDT – How large was the staff when you began? DL – We were a staff of only three persons in the beginning, [producing] 20,000 liters and we did everything by ourselves, except the picking. Only in 2001, the first man, winemaker Carlos Ramos joined. He was very young but very nice and [a] kind man. He is still with the company, a very good partnership. Most of the people [in the company] are women. I still have 20 women working in the field. MDT – Is your wine made only with Portuguese wine grape varieties? DL – This is our second specialty. I’m just working with Portuguese wine varieties. The most important brand we have is Plansel. The name comes from ‘planta seleccionada’ [selected plant], so I’m only using the plants we have selected. Nowadays we have 75 hectares, but five hectares are still from the base, where we have the older original plants. MDT – What is it that’s so special about these Portuguese wine varieties? DL – Portugal has got 380 varieties. Some of them are really special, but [with] most of them you have to plant them together to make a good wine. But we [Portugal] have some special variety, I believe it could be like a pilot variety for the whole world. The number one [variety] at the moment is Touriga Nacional, because it is adaptable to all regions worldwide. There’s only one other variety that can adapt as well, Cabernet Sauvignon, which is well known all over the world because you plant it in Africa and in America and it always makes good wine. Touriga Nacional always makes [a] very interesting and different kind of red wine, with some floral notes, adding on to the fruitiness and the berries. The pH, acidity and alcohol always is in a perfect performance [arrangement]. For me, you can easily make a monovariety with Touriga Nacional. I have other two varieties I really love: Touriga Franca and Tinta Barroca, which make very fruity, dark, cherry, elegant wine[s]. Touriga Franca gives a lot of color and tannins and dark fruit, a little bit like Shiraz. I can easily make monovarieties from that. These are the three main varieties I’m focusing on. MDT – You mentioned that around 50 years ago the Portuguese wine was not good. There was a massive development and it is now becoming famous internationally. Why do you think that happened? There was no sophistication in the wine production before? DL – There was no section in the vineyards. They had sometimes 20 different varieties in one vineyard and they were harvested at the same time. You cannot harvest different varieties at the same time. Each variety has a maturation [that becomes] ready in a different time. They had no control at [over the] vineyards. In the last 10 to 15 years, with young people coming [to the industry], it is has changed. You look first to the field and to the vineyards and then you look at the winery. It is important to know your fields. If you observe what happened in Portugal, lot of the vineyards have been taken over and replant[ed] with new vineyards and new varieties. I just feel sorry for the Lisbon and Tejo region, because many immigrant varieties are coming in. There is a lot of Cabernet Sauvignon, Merlot and Chardonnay. They are planting the international varieties, because they think it is better in marketing and sales. That is an absolute mistake in my opinion. We should focus more on the native varieties, because we really have good ones. There are varieties that are just good for the north of Portugal, like Baga, but we have varieties that can work all over Portugal and make really great and special wines. MDT – Do you think the Portuguese wines will get more varied and internationally recognized? DL – I do. We can’t forget that in Portugal Aragonês is a dominant variety. Aragonês is similar to Tempranillo, which is a very good grape variety. Those varieties have 50 more synonyms and are planted all over the world. So Tempranillo and Aragonês is the most planted variety all over the world, much more than Cabernet Sauvignon. In Portugal, the first variety at the moment is Aragonês, second is Touriga Franca and third is Touriga Nacional. MDT – Two thirds of Quinta da Plansel wine production is exported. Which are the main markets? DL – It has to do with my history. I’m native German and I think I’m a little bit the ambassador for Portugal in Europe. I do a lot of seminars, wine tasting and I’m also teaching in the University of Geisenheim, where I do lessons about Portugal. I’m really trying to bring the Portuguese varieties to Germany and Switzerland. That’s [priority] number one for me. Nowadays I’m selling about 150,000 wine bottles just to small wine shops and retailers. So, it is never going to the supermarket. The second market for me is Switzerland and I’m everywhere a little bit in Europe. Outside [Europe], I’m very glad to have Haigan [Wong, director of Adega Royale], I think we work quite well in Hong Kong and Macau and I have a very good partner in Taiwan. On the other side of the world, I’m working quite well with Canada and Brazil. I also have an importer to Angola, but I’m not focusing there because all the Portuguese people are focusing in Angola and the competition is so high at the moment… The price is dropping down and that is not where I want to go. I try to focus on high quality level wine and I want to show the people the passion of our company. I see that my daughters want to come into the company too, so I think it is very important to stay as a family and do something special. To show the people that we have something special – the monovarieties –and we focus on the native Portuguese varieties. MDT – The property also hosts an eco-tourism project, with wine tasting sessions and lodging. Is that an expanding business? DL – It is new. It’s something we need for Portugal. Nowadays the people, especially the European people are increasingly coming to Spain and Portugal because of the crisis. Last year, we had 17 million touristic visitors in Portugal. People are not just coming to enjoy the seaside, they are really interested about culture and wines and olive oil.. The sales from wining estates in Portugal have been increasing extremely in the last two years. People come there [to wineries] to buy and also take wine home. This is quite interesting for us. We made the decision two years ago to build up a new tasting room, which is not ready yet. We created space for people to taste the wines in nearby a garden and next to the swimming pool. We are trying to push that, because there are a lot of people passing by and buying wine. There are many international visitors such as a lot of people from Canada, Brazil, as well as a lot of Germans, Danish and Dutch visitors. It’s good for the visibility, which is very important: people have to find you, they have to see you. My idea is not to make a shop, but I want people to see a little more of what we are doing. MDT – In Macau there is a large offering of Portuguese wines, many of which are available in supermarkets. Do you see Macau as a platform for Portuguese wines? DL – Not anymore. I think the market is overloaded in Macau. This is an old Portuguese colony and if you look at Portugal’s economy and the building up of wineries… It’s crazy what happened. I think it was okay for Portugal to come to the European Union in 1986, but the European Union did a lot of mistakes. They sent enormous amounts of money to Portugal and it wasn’t really controlled. A lot of people from the banks were very clever because they could fill out all these documents to get subsidies. Suddenly, especially in Alentejo, you find that many wineries were built up in the last 10 years just with subsidies. And we are talking about big wineries, with 100 hectares. From one day to the next, we had wineries producing 5,000 bottles. They had no time to build up a brand or create a marketing strategy. They just got the money from the European Union and they built up enormous wineries. What are they going to do with such amount of wine [they produce]? Build up a new brand? It is quite difficult, you need a lot of years for that. What [will] they do? They send the wine to Macau, to Angola, to Brazil, to all these old colonies. A lot of cheap wine went to those places, overloading everything and losing a little bit [of] the standard. If you look back, eight to 10 years ago, it was normal that you had very expensive and high quality wines here in Macau. Nowadays people go to the supermarket and they have MOP30 wines… So, I think my competitors are all losing money. It is not possible to produce a bottle of wine and sell it for EUR1.50 – that’s what most people are doing. At that price you don’t pay for the bottle, cork and the work in your field. It is really ridiculous what’s going on at the moment, and they are destroying the market. That is not the way I want to go. I’m not going to produce more, I think 5,000 bottles is already a lot. MDT– Do you think these big producers may swallow the small ones? DL – What I’m a little bit frightened [of] is that the big ones are absorbing the medium and small ones. So I think the future in winemaking will be very big companies. Look at Symington, which holds 70 percent of the Port Wine market. They bought several companies. Other company, Sogrape, is buying a lot of wine in the Alentejo and Lisbon areas, and is growing enormously. We are talking about 400 million bottles of wine. The smaller brands have to build up a personality and make something special. Like [us,] we focus on the family and we try to put our family into the label, so that the people see the family relation. MDT– At Quinta da Plansel, you try to introduce new types of grapes and mixes. What are the results? DL – Yes, and that is why we have this family estate. We are not really aligned, if we find something very special, we do a special blend and we name it with my name, or with whoever had the idea. Probably we are going to have a new red special wine named after Luísa [one of Lindemann’s daughters] using Alicante Bouschet together with Touriga Franca. Probably this will be the news for next year, because the wine needs time, it is not ready yet. But that wine looks great and I believe we will do something very interesting there. MDT – How does this Macau partnership with Adega Royale work? 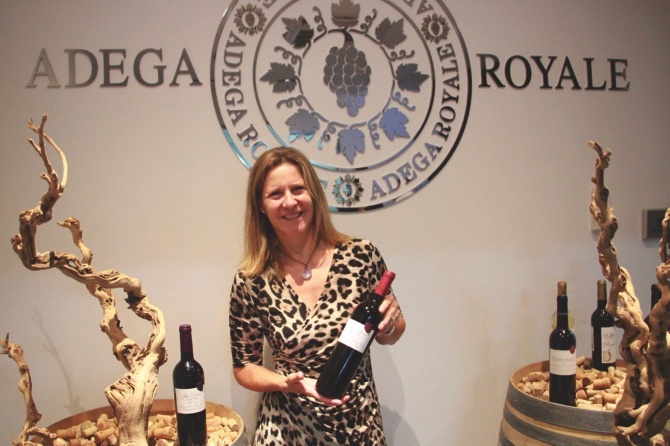 DL – I think Haigan [director of Adega Royale] tries more to work with the good restaurants, hotels and not with the wine shops. Because if you put the wines in wine shops, the restaurants are not going to buy them. Especially in Hong Kong I see that if the wine is in the shop, the restaurants are not going to touch it.